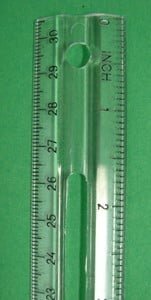 Transparent plastic rulers include both U.S. customary and metric scales. Features holes for easy storage in a binder. Rulers measure 12″/30cm. Set of 36. *Ruler is clear. Green background used to display incriments.